Song Possibilities for Adam Lambert’s iHeartRadio Concert with QUEEN!!! You are here: Home / Tours and Live Performances / 2012 Queenbert / Song Possibilities for Adam Lambert’s iHeartRadio Concert with QUEEN!!! Queen’s Brian May has been busy on Twitter folks. He’s passionate about his contact with his fans, just like someone else we all know and love! Brian asked his fans what they’d like to see Adam Lambert sing with Queen, and the votes started coming in. He said about 90 songs got at least one vote, and the winners were surprising to him. He listed them in abbreviated form, and I have to admit that I had to look up some of the abbreviations. ***SPOILER ALERT: Skip to the tweets below before you read on, if you want to quiz yourself. Did you get them all? He reported “way out in front with 20% of the vote was Who Wants to Live Forever and The Show Must Go On with 10%. With 6% was Killer Queen, Another One Bites the Dust, We are the Champions and Under Pressure. Then came Dragon Attack (with the FABULOUS red jacket!) Somebody To Love, I Want To Be Free, Radio Gaga, We Will Rock You, I Want It All and Fat Bottomed Girls. He even said there was “a lot of desire out there for David Bowie to join us. T’would be cool.” Cool?? I think that would ab-so-frikkin AMAZING! And the conversation ended with a totally typical Glambert comment! Wow ! Thanks for a great and informative response to Queen/Adam Lambert songs you wanna hear. I'll tell you what you voted for most ..
OK. Way out in front WWTLF. ( 20%) Then TSMGO. (10%). Then KQ, AOBTD, WATC, UP all at about 6%. Then DA, STL, IWTBF, Gaga, WWRY, IWIA, FBG. We'll have a think, and maybe throw in something surprising. I note a lot of desire out there for David Bowie to join us. T'would be cool. Who out there is going to this once-in-a-lifetime show? By some stroke of miracle, I can’t believe I’ll be there. I’ve been entering the text word, like I’m sure many of you have, and I got the call 3 weeks ago that I’d won! I’m still pinching myself! Of course Lila will be my guest, and we’ll be sure to report anything we see! Super excited about going. I can’t believe Carol’s luck! AMAZING!!! Oh Boy, how lucky you are, I can imagine the excitement you must have felt….have a great time…..Wave the “aussie’ flag for all his fans ‘down under’ who miss him. I’m so sorry I missed the opportunity to vote for some songs. I like them all, but I would have liked to vote. Thanks Carol. 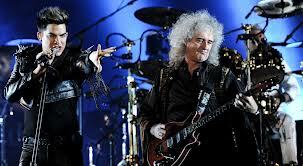 sigh…I sure wish I could be at this concert…before Adam, my all time favorite Freddy Mercury and Queen. I would love to hear Adam sing some of the “campy” songs like Good Old Fashion Lover Boy or Don’t Stop me Now, although just being there would be AWESOME! Don’t stop me now is awesome. Who wants to love forever is hard song to do right. Dragon Attack is good when done with some funk. But what I would love to hear is an original song by Adam and Queen together. Really up tempo full speed ahead rock n roll. Lots of range and tempo changes too(mello at first then full out screaming and take no prisoners attitude). Was I the only one who voted for Bohemian Rhapsody ?